Mommies, do you know you can get tax deduction for the breastfeeding equipment that you’ve purchased? 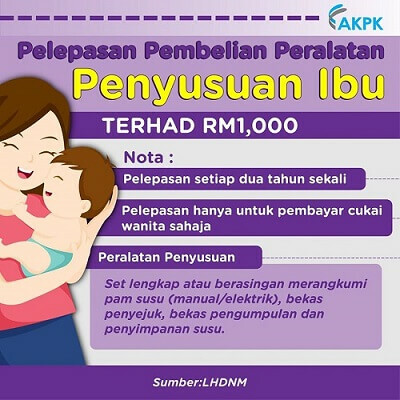 The Malaysian Income Tax Department or Lembaga Hasil Dalam Negeri (LHDN) allows you to claim up to RM1000 for breastfeeding equipment. What are the items defined as breastfeeding equipment? I did some research online and found some information. Remember, you can only make income tax relief for breastfeeding equipment once every 2 years. Most important, make sure you still have your purchase resits. In conclusion, if you are doing your income tax return this year and you’ve bought some breastfeeding items such as hand pumps, electric pump, storage bags, carrying bags etc, make sure you claim your tax deduction. The figures may not be big, but nonetheless, it is still saving on your household income. Mommies, do you want to know how you can lose weight without exercise or changing your diet? If you do, click here.